tralia also ran welll, but did not seem to have the necessary power. Competition also will come from two motor scooter Lambrettas. Victorian motor cycle and motor car specimen were the outstanding performers at the Jubilee TT meeting on the Woodside circuit yesterday. There was a record attendance and although the meeting was free from serious accident, St. John Ambulance officials gave first aid to several riders who received abrasions in falls. An Italian scooter with a 123. c.c. 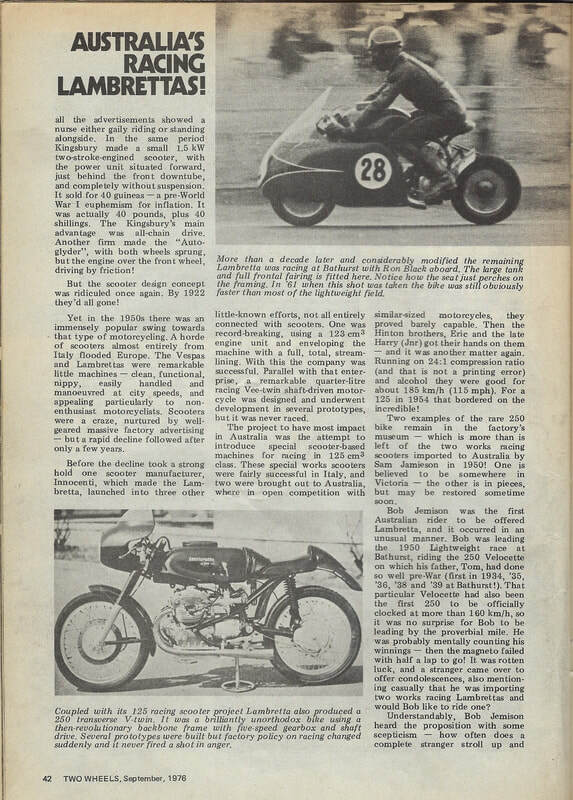 Lambretta engine provided the first surprise in the ultra lightwelcht motorcycle race when Victorian rider A. E. Flood rode it comfortably to win by over half a mile. Flood was agaln to the fore In the lightweight event on a different machine, but he had trouble and was forced to retire. Sydney rider Lloyd Hirst led the field in the sidecar TT for five laps, but » minor mechanical defect forced him to lose his lead and he finished second. the pace hot from the --tart and wits responsible for many prominent rider* being rushed into corners and falls. Quincey, Campbell and Diener were other prominent riders to slide down in this first race. In the car events D. Whiteford performed in his usual masterly manner nnd g.iinod .1 popular victory In the senior event. C. Brown rVic.l. 125 c.c. Eysink; W. Hartncy IVic.l, 123 BSA. Time, 15 mm. 42 1-5 sec. Lightweight TT 15 laps, 15 miles; solo machines up to 250 c.c.1 — L. Diener. 248 cc. Vero cette; L. W. Fox. 249 c.c. Triumph; B. W. Orriss (Vic.l. 246 Excelsior: H. Beck. 250 c.c. Vcli cctte. 15 mm. 3 sec. Senior TT (11 laps. 33 miles; solo machines up to 1.000 c.c.) — L. Boulter, 596 c.c. Norton; O. Archibald (Vic), 499 Norton; F.I. McNamara. 596 Norton; C.
Lambeth (Vic). 348 cc. A.J.S. 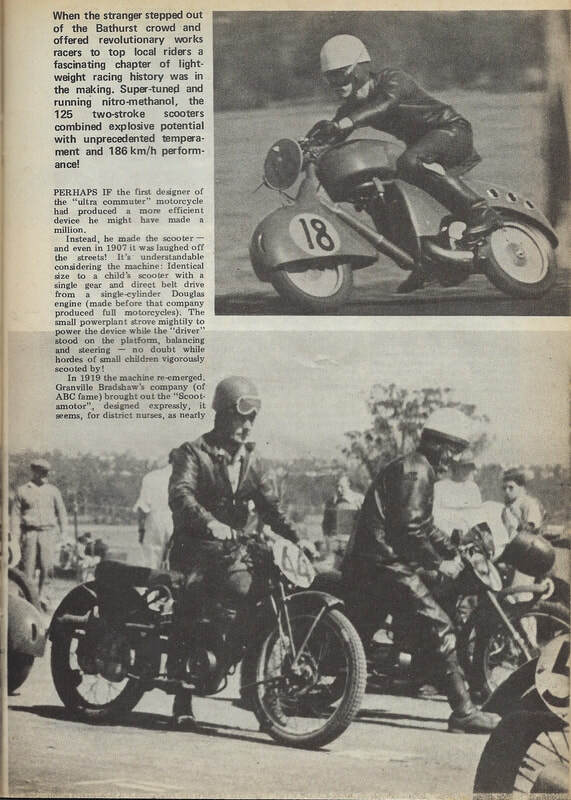 Sidecar TT (7 laps, 21 miles: upto 1.000 c.c.l— B. Mack IVic.l. 596 c.c. Norton; L. Hirst (NSW). 998 c.c. HRD: G. Skinner IVic.l. !-9B HRD. Junior Clubman's TT (6 laps. 18 miles: solo machine/;. 300-350 c.c.i — B. Watson, 348 Triumph: M. Neidorfer, 348 BSA; R. H. Pflueer (Vie). 348 BSA; J. McMahon iVic.l. 348 DouKlas: 17 mln. 14 2-5 sec. Senior Clubman's TT 16 laps. 16 miles 1— K. Rumble (Vic). 500 c.c. Matchless; M. Parkinson, 498 c.c. Triumph: C. Brown 'Vic). 500 c.c. Triumph; R. A. Wall. 498 c.c. AJS: 16 min. 53 sec. 'Without question, Mt. Panorama. racing circuit is the finest in Australia for road raicing," Mr. Wal Capper, secretary of the Auto Cycle Union, said in Bathurst yesterday. The meeting at Bathurst on Easter Saturday is the Union's classic event,. We have never considered changing its venue. A record entry of approximately 360 riders has been received for the meeting on Easter Saturday, April 12. Of these, a record contingent of 90 riders will come from Victoria. Representatives from every State, Including Western Australia and North Queensland, have nominated. One well known clubman rider from New Zealand will also take part. Eleven races, including the NSW T.T., in senior, Junior, lightweight. and ultra light-weight divisions, are on the extensive programme. The NSW Senior T.T. is, this year, open to machines of up to 1,000 cc. The sidecar scratch race, one of the features of the meeting, contains a large field of 27. Among the riders will be Victorian champion George Skinner (H.R.D). Bernie Mack (Vlc.) and Lloyd Hirst (H.R.D.) An unusual combination will be that of Harry Hlnton, who needs no introduction and his 17 year old son, Harry Junior. Jack Forrest, a rider who has shown remarkable skill at Bathurst, has under him an H.R.D. Black Lightning' brought back to Australia, by international Tony McAlpine and reputed to go 150 mph. The poupular ultra lightweight T.T. which was first held at Bathurst last October, contains a large field ot 48— 30 more than the field last year. Specially imported Lambrettas in road trim, are capable of 90 mph, while their main opposition will come from BSA Bantums, specially tuned, and reputedly timed at around 90 mph. Maurice Quincey, who is considered by many to be Australia's leading rider, will make his second appearance at Easter. Quincey, who has. entered in the junior and senior T.T. will ride two 'featherbed' Nortons. Also riding will be Sid Willis and Laurie Boulter. Mr. Capper said that entries were so large that fields had to be reduced. pected to arrive in Bathurst on Tuesday. The first two competitors in the T T. arrived on Friday. The main bulk of riders will file into the city on Wednesday. Bathurst will again see a 'canvas town' spring up on the outskirts of the city. An impressive array of riders and machines face the starter in the NSW Senior T.T, for solo motor cycles between 351cc and 1,000 cc. The race, which will be run over 12 laps (48 miles) contains 34 starters. .
Top. ranking men, Maurice Quincey, (Norton). Harry Hinton (Norton), Art Senior ( Senior 500) Laurie Boulter (Norton) , Jack Forrest (Vincent Bjack Shadow), Wal Hawtrey (W.R.H. ), J. Carruthers (Vincent), Lloyd Hirst (Vincent) and Jack Ahern (Norton), are likely to lead the rest of the field for most of the race. 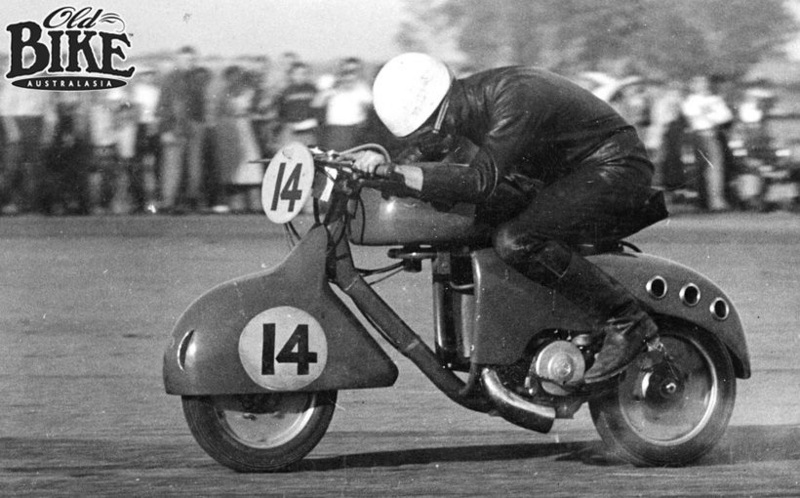 An ambitious entrant, Ken Waggot, will ride a 352 cc Mac Velocette against motor cycles of up to 750 cc higher in capacity. 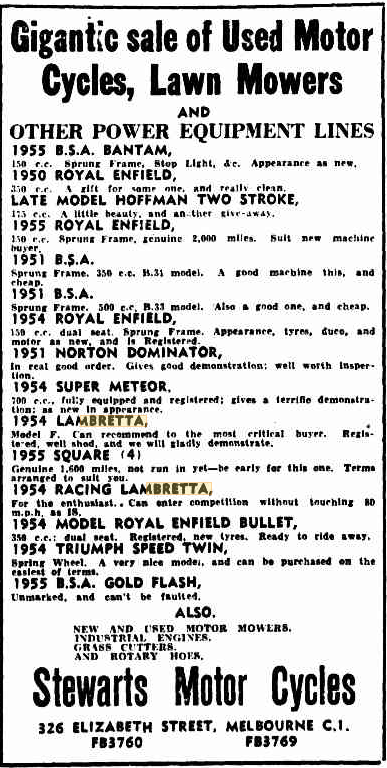 Motor cycle men will also watch with interest a continental machine, a Giletra 500 to he ridden by Keith Tolir.te. Two 'gold-Flash' BSA's have also nominated. The NSW sidecar TT and Abercromble Handicap, to be run over 20 miles, contains an interesting field of contestants. This race, always brings favourable comments from the public. Nine Vincent H.R D.'s and eight Nortons arc likely to be In the leaders at the finish, while main opposition will come from a special four stud J.A. P. 1,000. Exceptionally large fields in various heats of the Lightweight, Junior Senior (360 cc to 500 cc,) and ultra lightweight T.T. 's will provide a thrilling spectacle. A Villiers engined Dutch machine the Eysink which has had considerable success in Victoria will be ridden in the ultra-lightweight by ColinBrown. Three Tilbrook's one ridden by the manufacturer himself, Rex Tilbrook, and two new Lambrettas will be seen in this race. 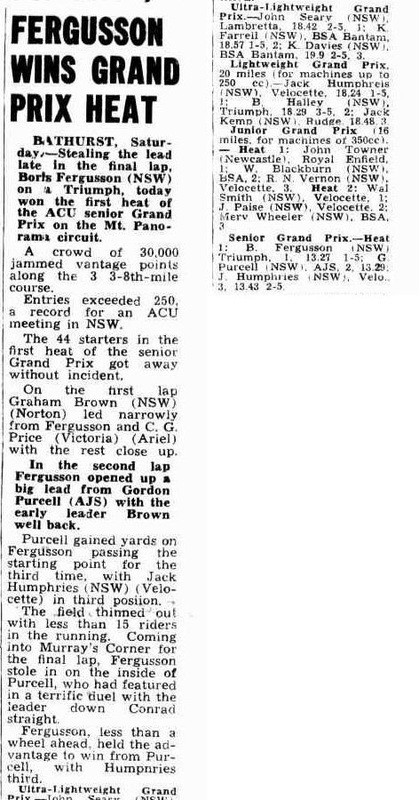 A veteran NSW rider, Harry Hinton, won both the senior and junior NSW Tourist Trophy races at the motor cycling meeting at Mount Panorama to-day. Although heavy rain fell overnight and a series of showers fell during the day the attendance was estimated at more than 25,000. 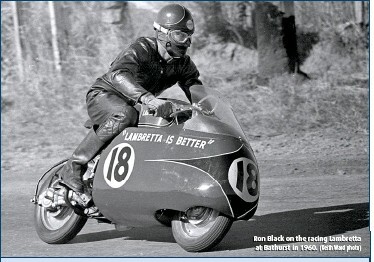 R Flood (Vic) 125 Lambretta 18m 49s 3. With warmer weather on the way some first class motor cycle race meetings will be conducted in the southern part of the State next month. The 'big' meeting will be at Orange on October 3, on the new Gloo-Blas racing circuit. Although only the second time that racing has been conducted on this circuit, it is already recognised as Australia's fastest track. With the State's best riders in action there it is anticipated that the coveted 100 m.ph.. lap record will be established at this -meeting. In January the lap record was set at 92.91, and since then the track had been made skid-proof and Is in first class order. Nearly all the leading riders who compete at Bathurst will appear and will ensure that first class racing is seen. 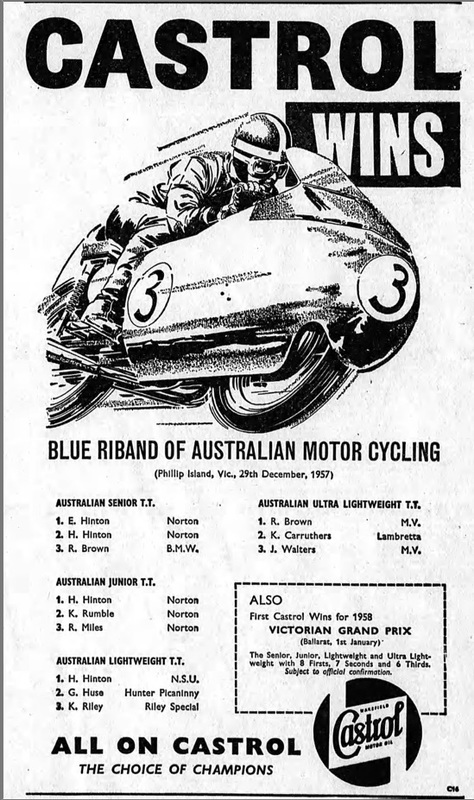 Riders Include Harry Hinton, treble winner at Bathurst last Easter; Art Senior, Jack Ehret and Jack Aheame. In the ultra -lightweight events there will be the Jamison brothers on works Lambrettas. As well as the open events, clubmen have been well catered for with A and B grade races. Wagga Motor Cycle Club members who have intimated they will be competing at Orange are Jack Skeers (A grade clubman), Ron Richards (ultra-lightweight) . Athol Cutler (B grade club man) and Bob Wilson (ultra-lightweight). All these riders will be making their first appearance on the Orange circuit and should make their presence felt. Jack's machine Is tuned by his foreman-mechanic, Stan Sweet, who has spent a life time at the trade. Stan says that the 'Gold Star' is in A1 order and expects a good showing from the machine. He said the machine is capable of speeds of up to 120 m.p.h„ which Is fast for A grade clubmen. record in the near future. Ron Richards and Bob Wilson will ride 'Bantams'. These two boys are very capable riders and although their machines may not be quite 'hot' enough, they will be trying all the way. The NSW airstrip championships to be decided at Tomago, Newcastle, on Feb 7 as part of the celebrations for the Royal Visit promise to be the most successful motor cycling race meeting ever held in the northern part of NSW. The big entry includes th recent holder of the Australian land speed record, Jack Egret. He has entered on the machine that broke the record, as well as on a special factory built 7R AJS. Keith Conley has entered on a special streamlined Lambretta that has taken off all events in Sydney, as well as on a special factory built KTT Velocette. 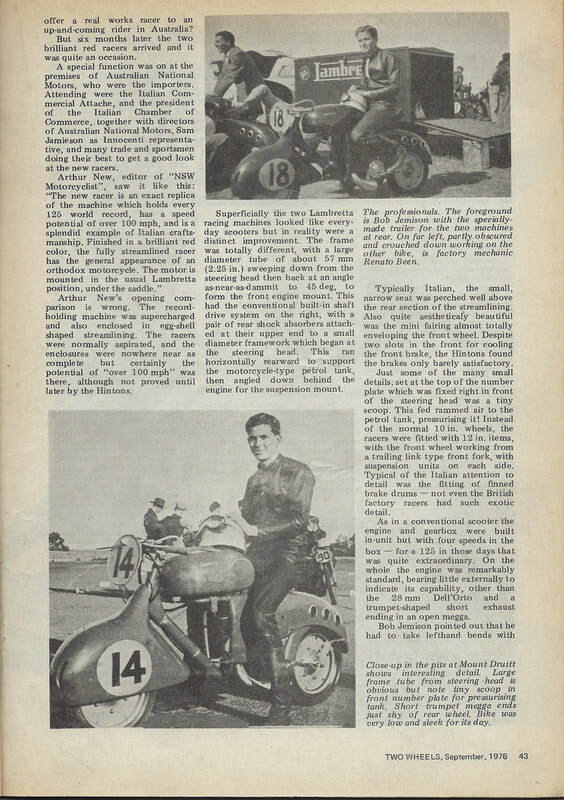 Harry Hinton, holder of junior, Senior and unlimited Australian record championships has intimated that he will enter on his factory built Manx Norton. Harry Hinton and his son Eric. will ride in the New South Wales airstrip championship at Tomago on Sunday. 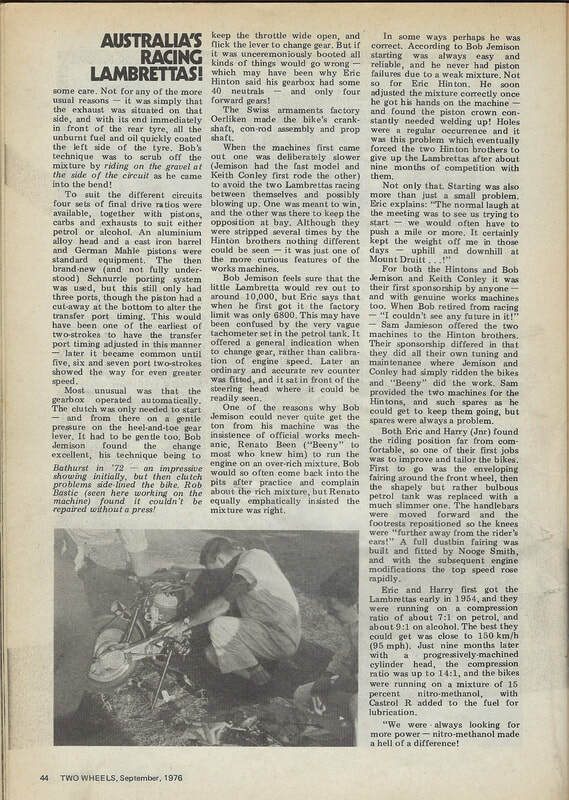 Norton, sen., probably Australia's greatest motor-cycle rider, will bring three Manx Nortons. He holds the Australian lightweight junior, senior and unlimited championships. He represented Australia in the world champion ships at the Isle of Man. known as the "maniac" on the sidecar. Other Sydney entries in clude Art Senior, riding a senior Ariel; Bob. Brown and Les Fisher, on Kessing specials; Keith Conley on his special enclosed Lambretta; Ron Williams on his Manx Norton and a KIT. Velos. JR Boy Racer A.J.S. .Northern riders include Gordon Purcell and John Towner, winners of N.S.W. clubmen's championships at Bathurst. and Gordon Greig, who finished second in the 24-hour car trial at. Mount Druit at the weekend, John Ward, on a DJ special: Reg Corbett, on a Vincent: Norm Fraser. on his fast J.A.P., and Pete Flynn on a "Shelsley" Matchless. Racing will start at the air strip. Tomago, at 10 a.m. on Sunday. One of the familiar faces of the Sydney motor cycle trade in the ‘fifties, passed away on 19th January. 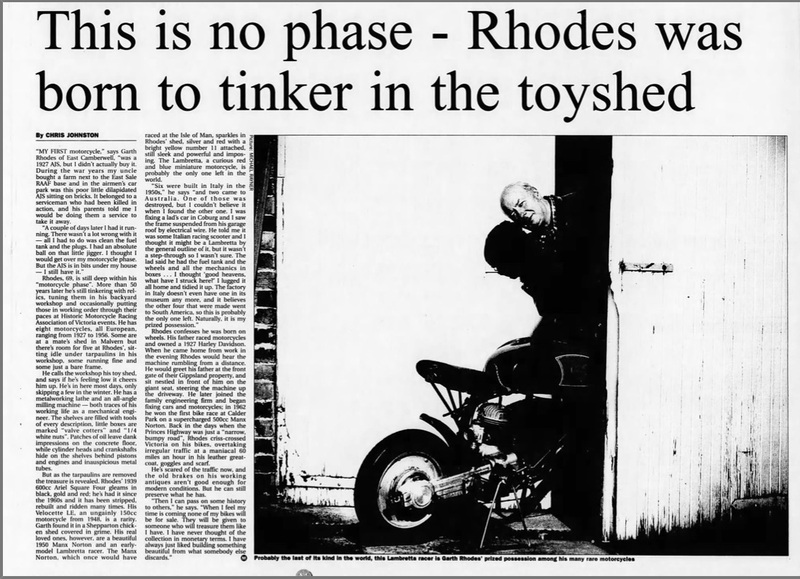 Ron worked for many of the big retailers over a long period of time, including Eric Moore and Hazell &amp; Moore, and was also a keen competitor in scrambles, short circuit and road racing. Eric Moore was the NSW distributor for Lambretta, and it was this connection that led him to purchase one of the two works Lambretta racing scooters that were originally brought to Australia by ‘Big Sam’ Jamieson. After leaving the motorcycle trade Ron worked at Boyded Motors at Auburn. I worked on most of Ron’s bikes and in the ‘sixties we travelled throughout NSW to race meetings. In later years we played squash on a regular basis and later still he took up golf. Ron is survived by his wife Judy, children Michael and Sally and three grandchildren. RON BLACK, During the halcyon days of the Willoughby District Motor Cycle Club in the late ‘sixties and early ‘seventies, the club had many factions for various forms of the sport, and for road riders. TREVOR QUESTED was a popular figure in the latter group, holding the role of club captain and taking part in the organization of many of the club’s events such as the Alpine Rally and the Clubman Rally. Trevor also competed at Moorebank scrambles riding an OSSA. A plumber by trade, Trevor moved to Bundaberg, Queensland in more recent times, where he passed away on 11th February. 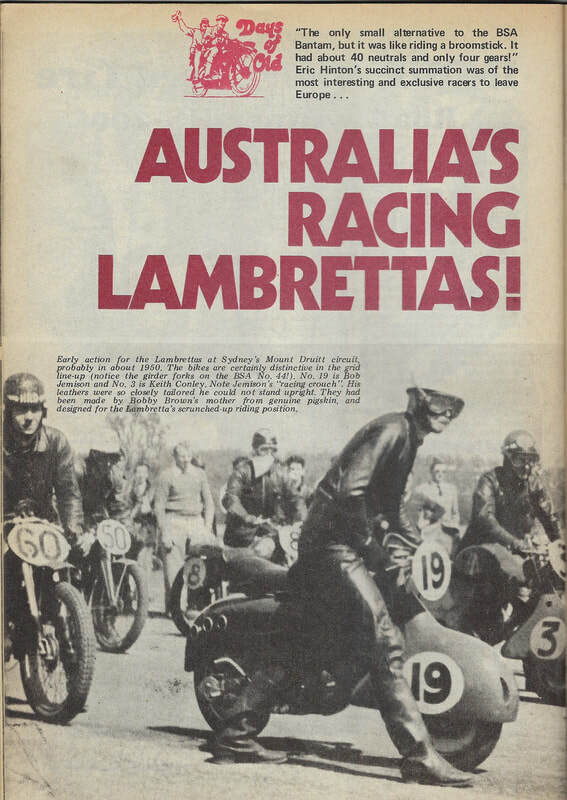 Instead of reproducing another web site, I've create the link to the "Old Bike Australia" page that refers to the Racing Lambrettas.